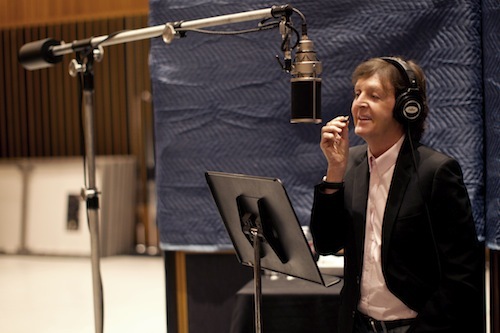 Paul McCartney has issued a sneak preview of his forthcoming album of cover versions (plus two new McCartney originals). The full album will be released by Hear Music/Concord Records on February 7. Wogblog has the full track-list, while the Beatles Examiner says that the album will definitely not be called “My Valentine” – this is despite the fact that it will be released in time for Valentine’s Day, 2012. Special guests on the album include Diana Krall, Stevie Wonder and, as you can hear on the track below, Eric Clapton on guitar. The record is produced by the legendary Tommy LiPuma and looks to have a strong jazz-influenced tinge to it. It’ll certainly be interesting to hear McCartney exporing this new territory. The song “My Valentine”, while newly composed, sounds like it could have come from the same era as the other songs he has chosen to cover. This entry was posted in Beatles, Beatles Collecting, Paul McCartney and tagged Beatles, Beatles Collecting, Music, My Valentine, Paul McCartney by beatlesblogger. Bookmark the permalink.